I carried out some routine maintenance on the VFRs on Saturday in preparation for our upcoming tour around the Alps. I changed the oil and filters on both VFRs, Helen’s was on 15156 and mine was on 25045 miles. I also stripped down Helen’s calipers and gave them a good clean and fitted new pads to the front as well. I also changed the brake fluid in both the front and rear circuits as it was due and also dark in colour. I also gave both bikes a thorough clean and removed as much chain muck as possible. Then I re-lubed the chain, sidestand and any other moving parts that required it. I had to fit new bolts to my peg rubbers as the original ones were missing. I’m surprised the rubbers had stayed on till now. 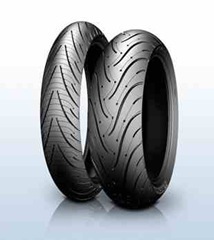 Also in preparation for the trip we also had a new set of tyres fitted to both bikes. As usual we got Bike Tyre Services to do the job, as it is far less hassle to get him to come and fit them at our house. We opted this time to have the new Michelin Pilot Road 3s fitted. We have had no issues with the Road 2s but have heard the new version is excellent in the wet. They do look a bit odd with the cross cuts on the front but after initial testing appear to perform the same as the Road 2s.